Musings from Marilyn » Those Cute Fluffy Angora 60s Mini Dresses! Posted May 13, 2013 by finnfemme & filed under Fashion, Vintage. 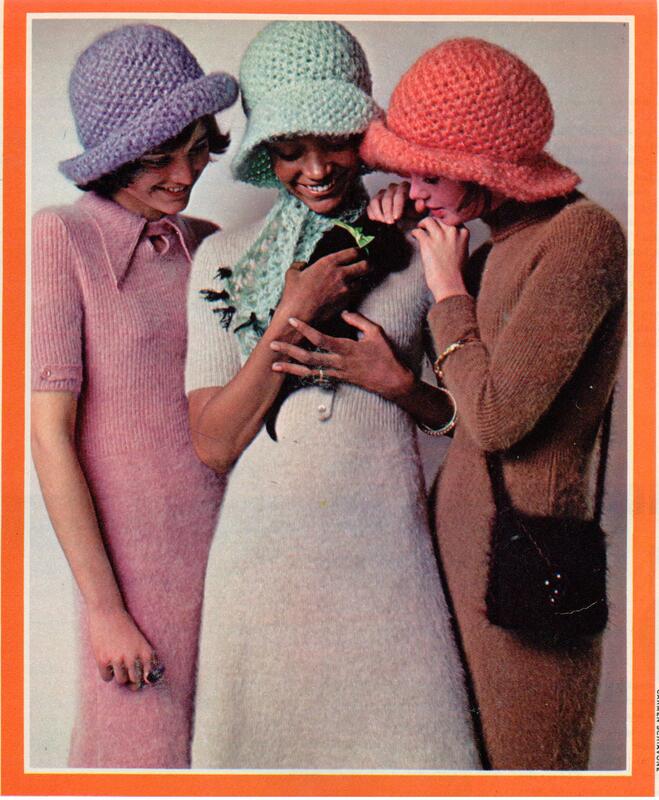 There was a period in the late 60s/early 70s when fluffy angora mini dresses were all the rage. Pretty in pastel colors, they are just so adorable with their soft fuzziness and mod mini styling. Pearls, long necklaces and earrings were the perfect accessories. 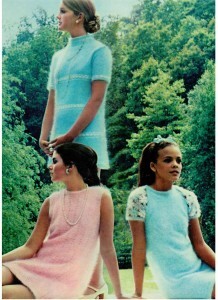 This trio of pink and blue angora dresses is from the September 1969 issue of Seventeen magazine. Here is another trio of fluffy beauties from the August 1970 issue. These pretty angora dresses are ribbed and have a mock turtleneck. I love their fuzzy cloche-type hats with added flower. A white angora shoulder bag and a cute white kitten make for great accessories! 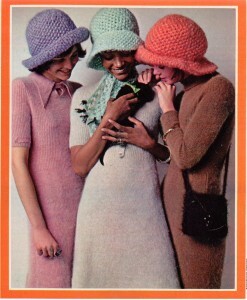 The same trio is now in furry ribbed dresses with brimmed hats. A black kitten is now in the mix, along with a fluffy black angora shoulder bag. 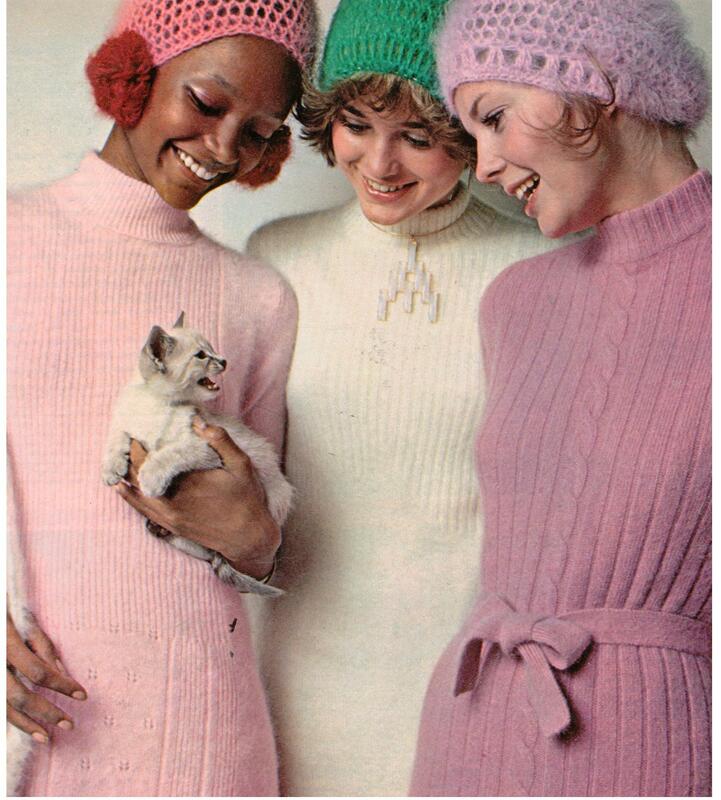 Cute kittens and fluffy angora – can’t go wrong with that! Ah. Yes i. 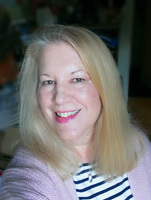 Remember i wore a robin’s egg blue short sleeved mohair dress, and all though it was nice and snuggie i felt as though every curve and inch of my body was out there -no hiding- Anything… back then I was willing to wear this type of attire~ these days, the looser the better!